188hp of combined hybrid power sounds good, and performance feels sprightly, but the Ford C-Max loses out where hybrids should thrive. Claimed EPA city figures of 42MPG and 104 MPGe for hybrid and PHEV variants are wishful thinking at best, and a 20-mile electric range is sub-standard. FWD and a CVT gearbox are standard. Titanium trim offers niceties like leather upholstery and Ford’s SYNC 3 system, and the Titanium Driver assist package adds blind spot monitoring to the C-Max’s safety features. Safety features include 7 airbags, as well as traction and stability control. If you want to build a capable hybrid, it’s generally best to engineer the platform for that purpose from the start. 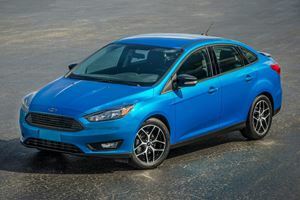 Ford thinks otherwise, and has turned the Focus into a hybridized MPV with the C-Max – available in mild- and plug-in hybrid versions. For Ford, this hybrid only line of vehicles needs to be good enough to outgun the Toyota Prius V. Unfortunately, though the C-Max has many redeeming qualities, it struggles to be a great example of either an MPV, or a hybrid fuel-saver. It’s a tricky scenario for the Michigan-based brand. Based on the Ford Focus, the interior design is simple, but feels solid. However, repurposed as an MPV, the C-Max gets a more upright seating position – great for visibility, but unfortunately not so great for comfort levels, as the seats don’t offer support enough for long-haul travels. For shorter journeys, seating for 5 is more than ample, with plenty head and leg room, and easy ingress and egress. However if there’s one reason you want an MPV, it’s likely for the masses of cargo space available; either with the seats upright or folded. Unfortunately, the batteries in the C-Max eat into trunk space. The C-Max hybrid boasts an ample 25 cubic feet, but the Energi (plug-in hybrid) offers a rather sub-par 19 cu ft with the rear seats in place. Drop the second row and you get 42.8 cu ft – it sounds decent until you consider that a Prius V offers a massive 25 cu ft more. Those redeeming traits I mentioned start here. Being based on the Focus means the C-Max shows real composure out on the road. The suspension is steadily supportive, though soft, and resists body roll. It doesn’t easily get unsettled either – absorbing bumps without losing a solid connection to the road surface. Those transitioning from youthful hot hatches into family life with this MPV will be pleasantly surprised at how enjoyable the drive can be – direct, communicative steering, and a chassis that responds to being pressed make the C-Max feel a lot more like a Focus than it does a family van. 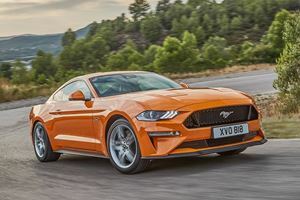 Of course the extra weight and raised proportions mean this is no hot hatch, and the grip levels run out in time to remind you of this – but the fun is real while it lasts. Hybrid electric motors are great for economy, 2.0-liter gasoline engines aren’t. 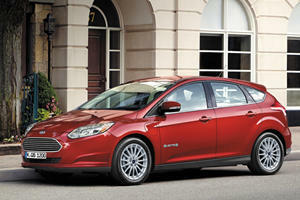 The C-Max combines the two for a total output of 188 horsepower. The electric boost means sprightly acceleration, and claimed EPA figures are impressive too, at 42 MPG in the city for the hybrid, and 104MPGe for the Energi PHEV. Real world conditions sadly never yield anything close – and the 20-mile electric range on the PHEV is sub-par too. Standard charge time for the PHEV is 7 hours from a 120V socket, but a 240V yields a more convenient 2.5 hour charge time. FWD is standard through a CVT (Continuously Variable Transmission) gearbox. Even in base SE trim, there’s decent standard equipment like a 10-way power adjustable driver’s seat, dual zone climate control, and a 110-volt power source. Leather upholstery is optional on SE trim, but standard on Titanium models which adds power adjustment to the front passenger seat, SYNC 3 infotainment, and optional active park assist. Safety is taken care of by stability control, potent ventilated brakes with ABS, and a full suite of seven airbags. The C-Max scores 4/5 stars in NHTSA crash tests, and received the best possible ‘Good’ rating from the IIHS. 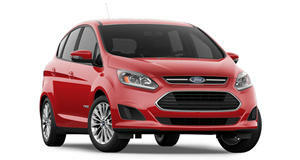 Fun as it may be for eager driver’s, the Ford C-Max tries and fails to combine MPV practicality and hybrid efficiency. Hybrid hatches offer similar practicality and the Toyota Prius V offers vastly better efficiency. Sadly, Ford missed the boat on this one. Try saying that after a few beers. We’re getting closer to the day that your next car will be delivered by Amazon Prime.